Wet Felting is one of my passions. I get completely lost in making a unique piece of colorful fabric from alpaca fiber or sheep wool roving. It’s like magic watching the individual fibers and hairs bind together to make fabric that you can cut or sew into clothing. 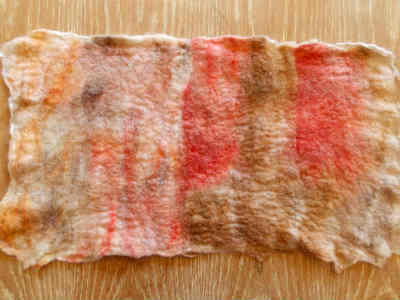 This is the first part of my Wet Wool Felting Series. The other wet felting tutorials in the series include Nuno Felting, Cobweb Felting, Lattice Felting and Vessel Felting aka How to Make a Felt Bowl. 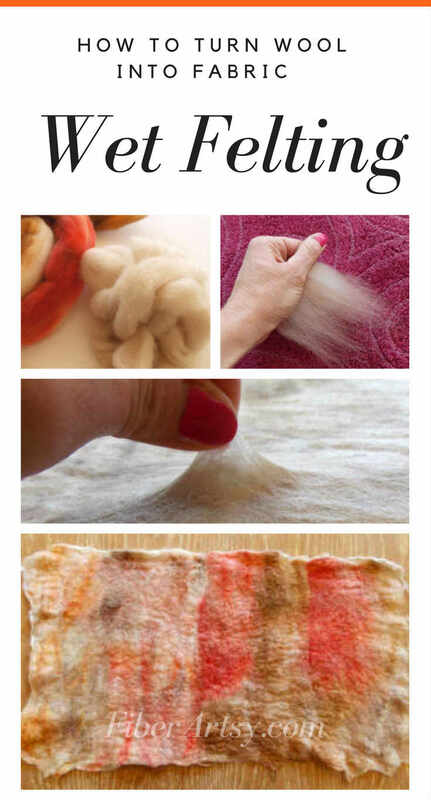 Part 1 will show you the basic steps involved in wet felting wool. I will teach you step by step how to take the loose wool locks or wool roving and create a piece of fabric. Once you have the basics down, you can wet felt just about anything! If you’re a beginning wet felter, you may be interested in my article Felting: A Beginner’s Guide. 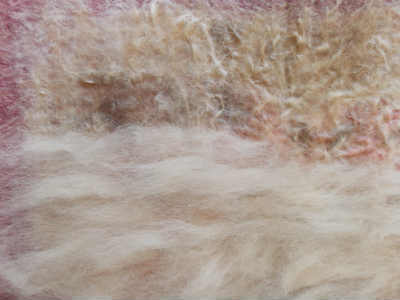 Wet Felting is the process of connecting or blending wool or fiber together to make a fabric. Here is how Wikipedia defines Felting. Disclosure: This page contains affiliate links which simply means if you click through and buy or sign up, this site may get a small commission, at absolutely no extra cost to you. How much wool roving you need depends on how large a piece of felt you want to make. 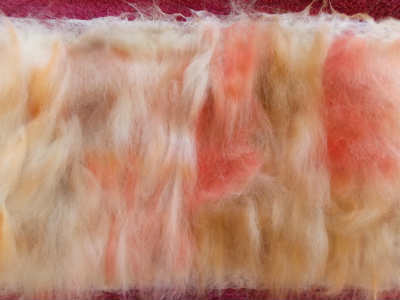 This felted piece will be about 20″ x 12″ so 2 ounces of alpaca or wool roving is plenty. I’m using hand dyed merino wool roving for the front and light fawn alpaca roving for the other side. If you prefer, you can use just one color of fiber. **If you’re going to do a lot of wet felting, a Matchstick Blind is a great felting tool. They are durable and last a long time. Bubble wrap is a more affordable option if you’re only doing one or two projects. First, you want to cover your table with the plastic. 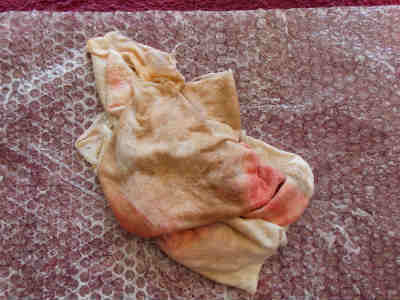 Felting uses a lot of water so you may need to cover the floor as well. Next, you will place a large towel on the table and then the matchstick blind or one piece of bubble wrap on top of that. Now, take a piece of the roving (I used the dyed merino wool) and pull thin tufts from one end. Lay these fibers down in a row, overlapping the layers by about 1/2″. Make sure all the fiber is going in the same direction. Add a second row, again overlapping the fiber about 1/2″ and overlapping the rows. Add more rows of wool fiber until your piece is about 30% larger than the final size you want to allow for shrinkage. 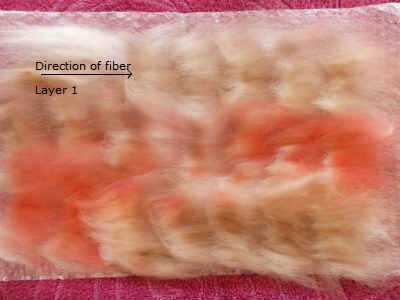 Fiber shrinks as it is wet felted. Fill your bottle with hot water and add a few squirts of the dish soap. 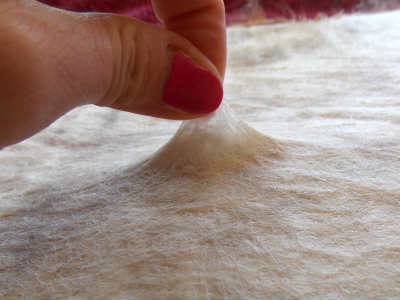 Gently shake and then generously sprinkle the water on your layer of wool fiber. Next, place your hands flat on the wool and move them slightly back and forth. You want to work the water into the fiber without moving the actual fiber too much. Add more water if needed. Make sure all of the wool is thoroughly wet because dry pockets inside the layer of wool fiber will not felt. Once the first layer of wool is wet all the way through, add the second layer. In this piece, I used the light fawn alpaca roving for the back. The important thing to remember here is that the second layer needs to be perpendicular to the first. Ex: If the first layer of fiber was laid down horizontally, the next layer needs to go vertically. 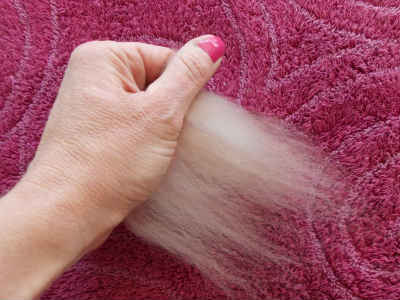 Follow with Steps 1 and 2: Pull thin tufts and lay them on top of the first layer. Sprinkle and work the water in with your hands. Repeat Step 2: Sprinkle and work the water into the wool with your hands. Since I want the outside of this fabric to be colorful and the inside plain, I now need to flip the piece over. Place the second piece of bubble wrap on top of your wool fiber and flip the whole thing over. Layer 1 should now be at the top. One more time … Steps 1 and 2 – Add the final layer of wool the same as before, using the dyed wool roving, place tufts of fiber perpendicular to the underlying layer. 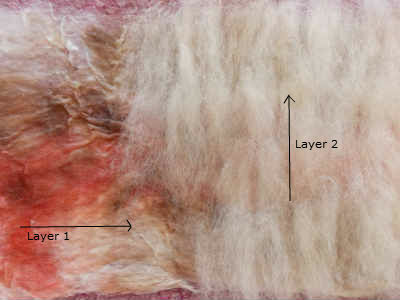 (Layer 4 fiber needs to go in the same direction as the fibers from Layer 2). Sprinkle and work the fiber with your hands. Now the real work begins! Place the second piece of bubble wrap on top of your fiber and begin rubbing with the flat of your hand. Work the entire piece – don’t forget the edges – in all directions, gradually increasing pressure. Do this for about 5-10 minutes. Carefully peel back the top layer of bubble wrap and with your thumb and forefinger, pull up lightly on the top layer. Is the wool roving holding together? If it is, move on to the next step. If not, sprinkle with more hot water, replace the bubble wrap and continue working the fiber. 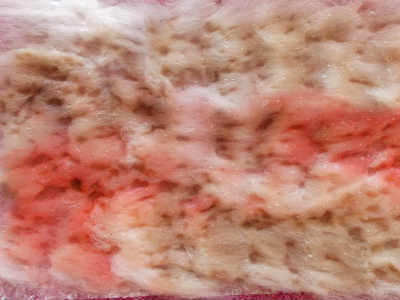 Fulling is the final wet felting stage where the fibers shrink and harden. With your wool sandwiched between the two layers of bubble wrap, roll up one end and then roll the whole thing into another towel. Using your hands, roll the package back and forth. Do this for about 5 minutes. If it comes apart, just roll it back up and continue. Finally, the last thing you want to do is throw your piece down on the table. That’s right, throw it! This is where the shrinking occurs. Throw it 30 times and check it. Stretch it out, throw it some more. It’s really up to you at this point and how you want your piece of felt to look. Update! Here’s what I did with my felted fabric. What would you do? WOAH! Thanks SO MUCH for linking up to our merry monday pinterest party! We are thrilled to have you! This looks crazy! Who knew?